Features Rare Recording of Jim Morrison Reading an Original Poem Proceeds To Help Raise Awareness For Nuclear Nonproliferation. 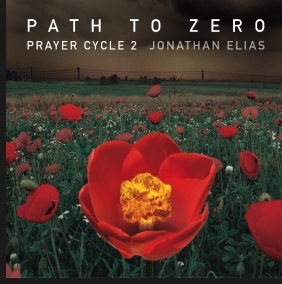 On May 10, Across the Universe Records will release Jonathan Elias' 'Prayer Cycle 2: Path To Zero,' a collection of music produced by the celebrated composer that features a stunning array of world-renowned musicians and activists. Proceeds from the record will be donated to Global Zero (http://www.globalzero.org/), an international organization dedicated to nuclear disarmament. Contributors include Sting, Robert Downey Jr., Sinead O'Connor, Serj Tankian and more. "'Path to Zero' is a classically influenced set of world prayers, inspired by the survival of hope in a world living under the shadow of the nuclear threat. As an artist leaving a legacy to my children, it's my prayer that they will be able to succeed in recognizing and changing the path we have chosen for the world, even if we cannot," says Elias. The CD is an eclectic mix of music with a sweeping number of influences from all over the world and across multiple genres--classical prayer/devotional music, spoken word, vintage radio samples, rock and more. "Having worked on so many different styles of music, I feel it's important to cross-pollinate in my own work," says Elias. On 'Prayer Cycle 2' his commitment to this challenge is brilliantly displayed. The CD features over a dozen different artists, multiple languages and musical genres. Additional contributors include Jonathan Davis of Korn, Afro-pop singers Salif Keita and Angelique Kidjo, Jon Anderson of Yes, Lilli Elias and Pakistan's Rahat Fateh Ali Khan. Elias is a long-time Hollywood musical innovator and was able to nab an unreleased recording of Jim Morrison reading a rare poem through a connection with the late producer of The Doors, Paul Rothchild. SYDNEY - 21st January 2011 - Sony Music Entertainment Australia is pleased to announce its support for the victims of recent floods across Australia through the release of a special benefit compilation CD "FLOOD RELIEF - Artists For The Flood Appeal".